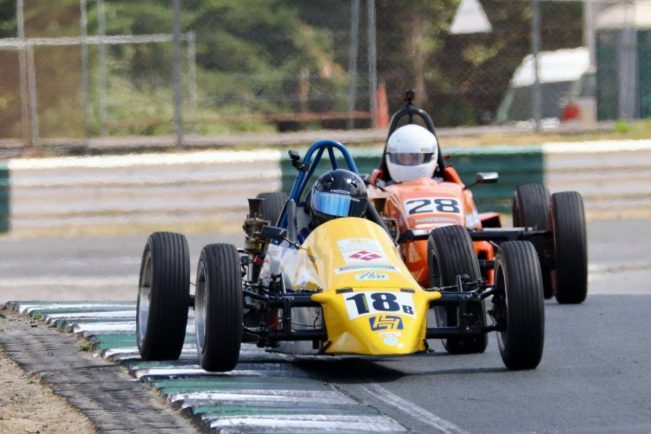 BROMSGROVE’S James Cater enjoyed two second place finishes in his class at the latest round of the Formula Vee Championship at Mondello Park in Ireland. Cater arrived at the track still not knowing if he could even get into his race car after breaking his ribs in a motorcycle accident just a week before the race and was in considerable pain. With only one brief test session squeezed in, Cater qualified 12th in the 15-car grid, knowing he needed to find at least another two seconds per lap to be in contention. A few changes to improve the car’s turn-in did exactly that and James stormed up to dice wheel-to-wheel with Bill Garner for the Class B win. After an amazing battle Cater found himself behind as he went into the last lap, taking several corners at high speed with his wheels interlocked with Garner’s before making a late dive into the very last corner. Unfortunately Cater spun off the circuit and lost a few places to finish 12th overall but still 2nd in class. For the second race Cater had gear selection problems, forcing him to do most of the race only in third gear. This put him out of contention for the class victory but he still battled to 11th place overall to pick up another second in place finish in his class. The next round of the championship is at Silverstone on August 11 and 12 where Cater hopes to take his first Class B victory.